Letting your car completely overheat is the quickest way to find yourself stranded on the side of the road and in need of a new car. Unless you want to waste money (and who does? ), it’s important to notice the warning signs that your car is about to overheat before it’s too late. Even when you’re in tune with your vehicle, an engine can overheat at a moment’s notice. Causes can include scorching heat outside, driving in bumper-to-bumper traffic for miles or hours at a time, or other engine-related problems. Overheating can even happen in cool weather. Here’s what to keep an eye out for. 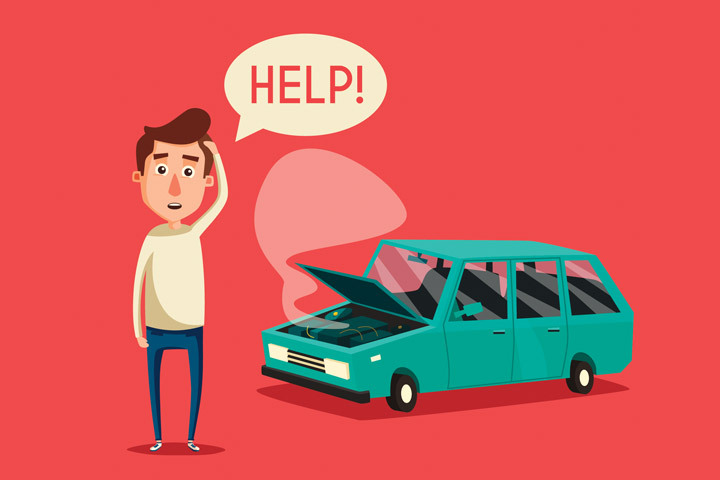 Malfunctioning parts in your engine can also cause it to overheat. Regular maintenance is a simple way to prevent problems. Checking hoses, thermostats and belts on a regularly scheduled basis costs much less than a new car or pricy repairs. Lift the Hood Carefully. If you’re able to pull over, pop the hood with the lever inside the car. Don’t try to do it manually because you could burn yourself. Once you’ve popped the hood, the engine will cool down faster. Wait. After lifting the hood, wait at least 30 minutes to do anything else. It can take some time for a hot engine to cool down. Don’t remove the radiator cap, especially if you’re seeing steam come from the engine. If you haven’t already called for help, this is the time to do it. Check the radiator for leaks. If the engine has cooled and there’s no more steam coming from under the hood, you can check for a radiator leak. Look for a puddle forming under the vehicle. Grab a cloth to protect your hand when opening your radiator, and look away from it when you open it, just in case there’s still a lot of pressure built up. Add antifreeze and water, with caution. Don’t just start adding cold water to the radiator or coolant tank because it can do a lot of damage to an overheated engine. Engines need a 50/50 mixture of antifreeze and water. If you don’t already have both water and antifreeze on hand, don’t attempt to do anything. If you have both on hand, make sure you’re using a 50/50 mix before pouring it in. Call for a tow truck. If there’s plenty of coolant in the tank, you could have an electrical or mechanical problem. Unless you’ve got the tools and the experience to check otherwise, a tow truck is probably your best option. The Garage Auto Repair in Broken Arrow can provide a preventative check of your car’s cooling system to prevent overheating problems. And if your car does overheat, don’t hesitate to contact us. We’re just a call away, and no appointment is necessary.